Change a flat? What's that? 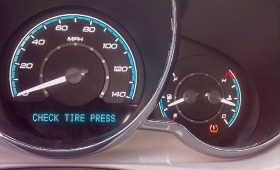 Tire pressure monitoring systems are one reason spares are disappearing. For decades, the auto and tire industries have chased the Holy Grail known as the run-flat tire to solve a motorist's mobility problems and do away with the spare tire, which just adds weight and robs valuable trunk space. Now the spare may be an endangered species, but not because tire makers finally have come up with an acceptable run-flat. Instead, other technological advances -- tire pressure monitoring systems, cell phones and on-board emergency call services -- have combined with improved roadside assistance programs to sound what may be the death knell for the spare tire. In explaining why it doesn't offer a spare tire on the new Chevrolet Cruze compact, General Motors pointed to those factors and a change in driver behavior. GM said only about half of drivers choose to change a flat tire on the road even when they have a spare tire. GM does offer Cruze owners the option of a space-saver spare, but the standard equipment is a tire inflation kit: a canister of sealant integrated into a plug-in compressor. GM even pitches the versatility of the compressor by including attachments so the driver can inflate mattresses, beach toys, etc. The Cruze is the third Chevy to get that treatment, after the retro HHR and Cruze forerunner the Cobalt. The Corvette has not had a spare on board for years, but it's equipped with run-flat tires. Other recent-vintage models with run-flats include the Cadillac SRX, Saturn Vue Greenline hybrid, Pontiac G8/GT, Ford Mustang GT500, Chrysler Crossfire, Mazda RX8 and Honda Fit. Interesting note: Most driving schools today don't teach students how to change a flat tire. Some require students to familiarize themselves with the workings of a car, but few if any offer hands-on experience with a tire jack and lug wrench.